IN NEED OF SOME UPDATING and offered with NO ONWARD CHAIN. WITH STUNNING VIEWS overlooking KINGSFIELD. 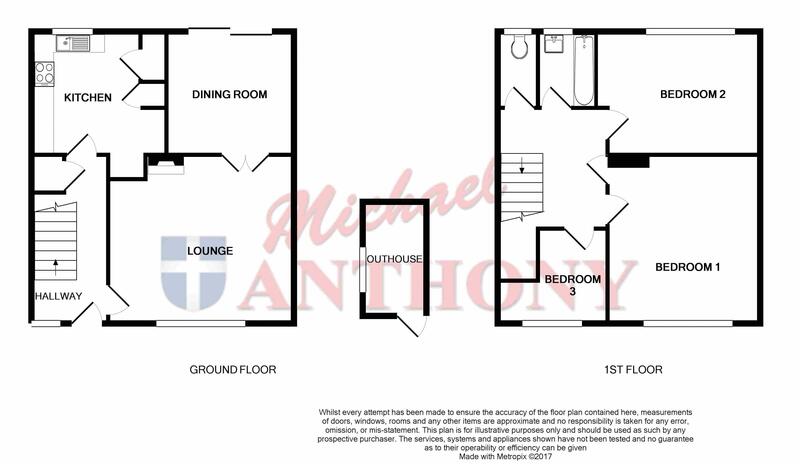 This THREE DOUBLE BEDROOM home, boasts LOUNGE WITH SEPARATE DINING ROOM. KITCHEN, BATHROOM and separate WC. Enclosed courtyard style garden with outside store. Gas central heating. Within walking distance of local schools and amenities. Double glazed front door opens. Door to lounge, under stairs cupboard, radiator, stairs to the first floor. Range of base and eye level storage units, work surface areas, double drainer sink unit, set below double glazed window to rear, tiled surrounds, floor standing gas boiler serving central heating and hot water, double glazed door to the rear garden. Stairs to the first floor, access to loft space, door to airing cupboard housing hot water tank. Double glazed window to rear, single panel radiator, coving to ceiling. Comprising of wash hand basin and panel bath, tiled surrounds, double glazed window to the rear. Low level WC, double glazed window to the rear. Enjoying an open aspect across Kings Fields, laid to lawn with pathway to the front door, screened by mature hedging. An enclosed rear garden with paved patio area, raised flower beds, outside security light, gated rear access, brick storage shed.